Mobile, at $75.0B, will capture 33.9% of total US media ad spending this year, surpassing TV for the first time. By 2022, mobile’s share will climb to 47.9%. 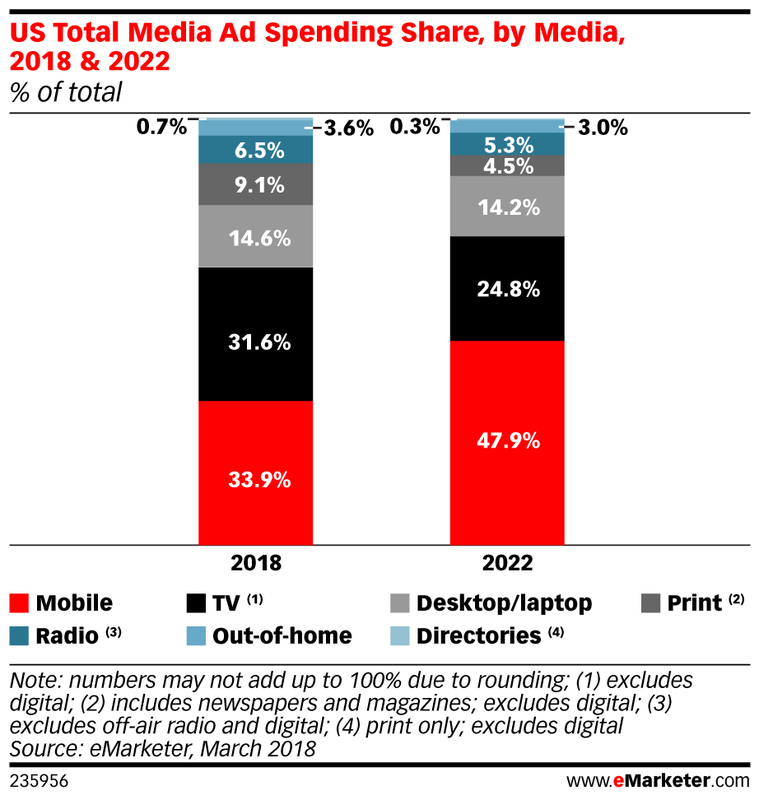 TV will capture 31.6% of total US media ad spending in 2018. TV ad spending will drop 0.5% to $69.87 billion. By 2022, TV’s share will slip to 24.8%. Nearly 70% of digital advertising will go to mobile formats. Trend No. 2 – Alexa, Are Voice Assistants the Next Big Thing? 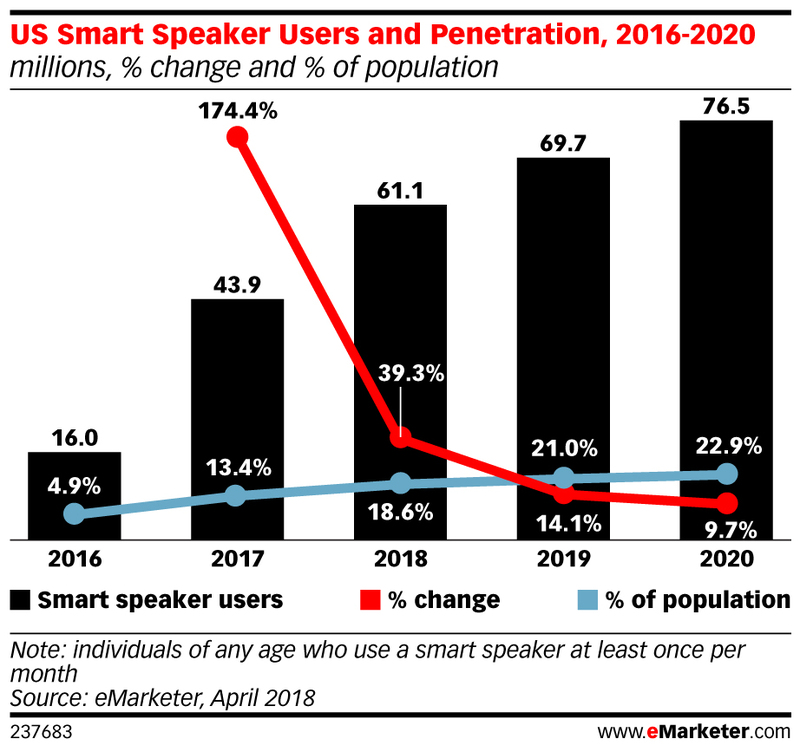 Stronger-than-expected adoption of smart speakers this year means the number of US adult smart speaker users, 61.1 million, will surpass that of wearable users, 50.1 million, for the first time. Additionally, smart speakers are changing how consumers find and buy products. 17.2 million consumers, which is 28.2% of smart speaker users, will purchase a product through voice this year, nearly two times the 8.6 million in 2017. 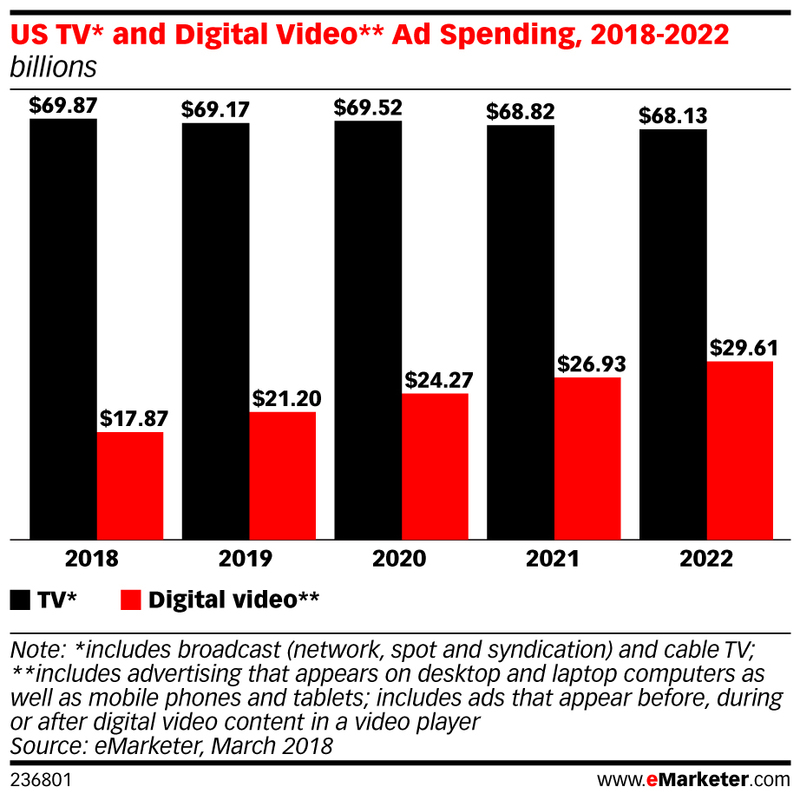 The growth rate of US digital video ad spending is faster than previously anticipated, reaching $29.61 billion in 2022. Traditional (linear) TV ad spending will follow a downward trend after 2020, dipping to $68.13 billion2022. The global AR market will be worth more than $165 billion in 2024. 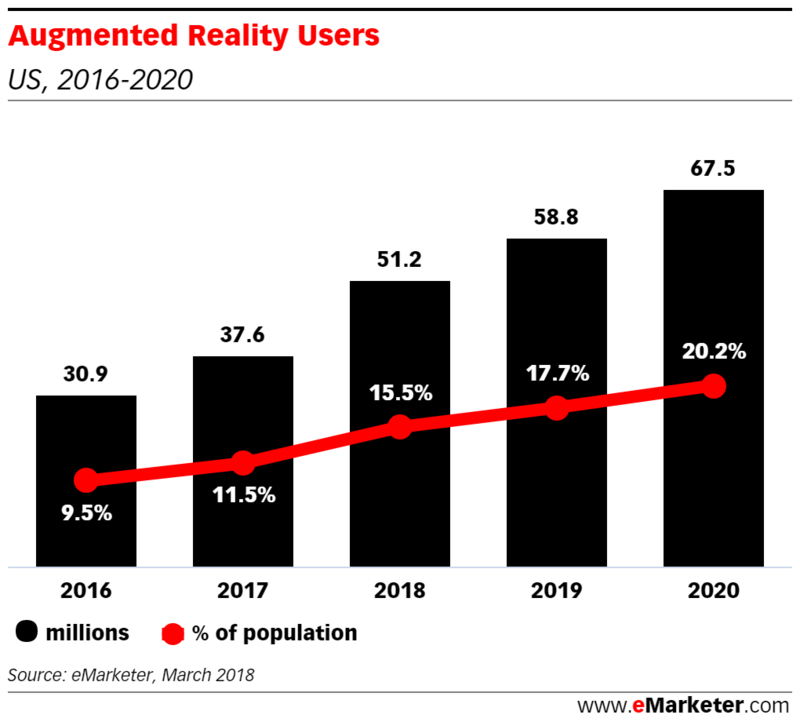 58.8 million people in the US will use AR by 2019. That’s 17.7% of the population. Marketers are striving for greater, more sophisticated personalization through consumer experiences and messaging. Why? Deeper connection. Greater relevance. Stronger loyalty. 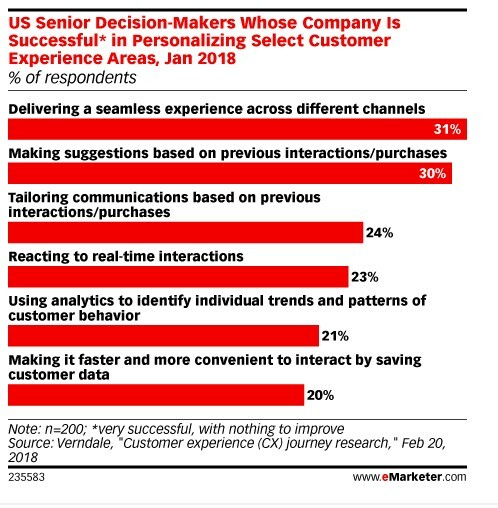 But only a third of senior decision makers believe their companies are successful at personalizing customer experiences. 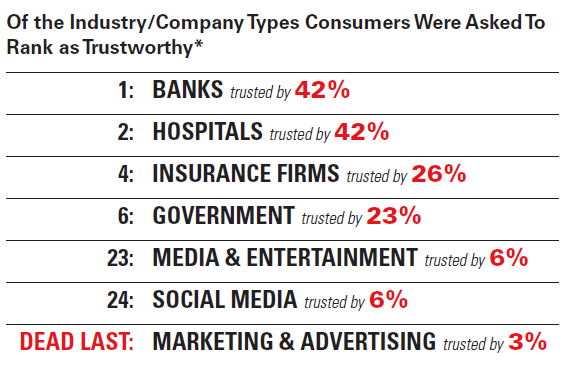 Consumers are quick to say they don’t trust the institutions that marketers depend on to get their messages out—media and entertainment companies and social media platforms — and they really don’t believe that marketing and advertising is trustworthy.